British-built Civic Type R for Japan | What Car? The British-built Honda Civic Type R is to be exported to Japan. High demand in Japan means that a limited number of European-spec Type Rs, built at Honda's factory in Swindon, will be exported to the company's homeland. The export model will be named the Type R Euro to distinguish it from the Japanese-spec four-door Civic Type R saloon. Japan is the third country outside Europe to import the Swindon-built three-door Civic Type R: Australia and South Africa already bring in the cars. 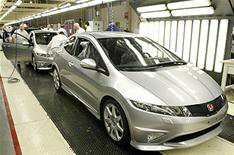 Workers at Honda's Swindon factory also build the five-door Civic, three-door Civic Type S and the CR-V.
Production of Jazz models for Europe is due to start this autumn.